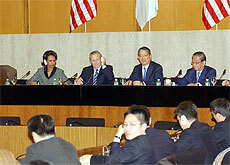 United States Secretary of State Condoleezza Rice and Secretary of Defense Donald Rumsfeld hosted Japan's Minister for Foreign Affairs Nobutaka Machimura and Minister of State for Defense and Director-General of the Defense Agency Yoshinori Ohno in a meeting of the Security Consultative Committee (SCC) in Washington, DC, on February 19, 2005. They addressed security and alliance issues facing the United States and Japan, as well as other aspects of the relationship. The Ministers noted the excellent state of cooperative relations between the United States and Japan on a broad array of security, political, and economic issues. They looked to expand that cooperation, recognizing that the U.S.-Japan Alliance, with the U.S.-Japan security arrangements at its core, continues to play a vital role in ensuring the security and prosperity of both the United States and Japan, as well as in enhancing regional and global peace and stability. The Ministers underscored the importance of U.S. and Japanese leadership in providing international assistance to Afghanistan, Iraq, and the broader Middle East -- efforts that are already producing results. The Ministers lauded the successful cooperation between the United States and Japan with other countries in extending wide-ranging assistance to those who suffered from the earthquake and the subsequent tsunami disaster in the Indian Ocean. The Ministers recognized that cooperation and consultation between the United States and Japan have been pivotal in promoting nonproliferation, particularly through the Proliferation Security Initiative. They welcomed the success of multinational interdiction exercises hosted by the United States and Japan and by others. The Ministers expressed their confidence that ballistic missile defense (BMD) enhances our ability to defend against and deter ballistic missile attacks and dissuade other parties from investing in ballistic missiles. Taking note of achievements in missile defense cooperation, such as Japan's decision to introduce ballistic missile defense systems and its recent announcement on its Three Principles on Arms Export, the Ministers reaffirmed their commitment to close cooperation on policy and operational matters and to advancing U.S.-Japan cooperative research in BMD systems, with a view to possible cooperative development. The Ministers discussed the new security environment in which new and emerging threats, such as international terrorism and proliferation of weapons of mass destruction (WMD) and their means of delivery, have surfaced as common challenges. They recognized that deepening interdependence among nations in a global community means that such threats can affect the security of nations worldwide, including the United States and Japan. While noting that these threats are also emerging in the Asia-Pacific region, the Ministers also emphasized that persistent challenges continue to create unpredictability and uncertainty. Moreover, they noted that modernization of military capabilities in the region also requires attention. The Ministers strongly urged North Korea to return to the Six-Party Talks expeditiously and without preconditions, and to commit itself to complete dismantlement of all its nuclear programs in a transparent manner subject to verification. Based on this understanding of the international security environment, the Ministers concurred that both Governments need to work closely together to pursue common strategic objectives through their respective efforts, implementation of the U.S.-Japan security arrangements, and other joint efforts based on the alliance. Both sides decided to hold regular consultations to coordinate policies in accordance with these common strategic objectives and to update these objectives as the security environment requires. Ensure the security of Japan, strengthen peace and stability in the Asia-Pacific region, and maintain the capability to address contingencies affecting the United States and Japan. Support peaceful unification of the Korean Peninsula. Seek peaceful resolution of issues related to North Korea, including its nuclear programs, ballistic missile activities, illicit activities, and humanitarian issues such as the abduction of Japanese nationals by North Korea. Develop a cooperative relationship with China, welcoming the country to play a responsible and constructive role regionally as well as globally. Encourage the peaceful resolution of issues concerning the Taiwan Strait through dialogue. Encourage China to improve transparency of its military affairs. Encourage Russia's constructive engagement in the Asia-Pacific region. Fully normalize Japan-Russia relations through the resolution of the Northern Territories issue. Promote a peaceful, stable, and vibrant Southeast Asia. Welcome the development of various forms of regional cooperation, while stressing the importance of open, inclusive, and transparent regional mechanisms. Discourage destabilizing sales and transfers of arms and military technology. Maintain the security of maritime traffic. Promote fundamental values such as basic human rights, democracy, and the rule of law in the international community. Further consolidate U.S.-Japan partnership in international peace cooperation activities and development assistance to promote peace, stability, and prosperity worldwide. Promote the reduction and nonproliferation of weapons of mass destruction (WMD) and their means of delivery, including through improved reliability and effectiveness of the Non-Proliferation Treaty, the International Atomic Energy Agency, and other regimes, and initiatives such as the Proliferation Security Initiative. Coordinate efforts to improve the effectiveness of the United Nations Security Council by making the best use of the current momentum to realize Japan's aspiration to become a permanent member. Maintain and enhance the stability of the global energy supply. The Ministers expressed their support and appreciation for each other's efforts to develop their respective security and defense policies. Japan's new National Defense Program Guidelines (NDPG) emphasize Japan's capability to respond effectively to new threats and diverse contingencies, Japan's active engagement to improve the international security environment, and the importance of the Japan-U.S. Alliance. As a central component of its broad defense transformation effort, the United States is reorienting and strengthening its global defense posture to provide it with appropriate, strategy-driven capabilities in an uncertain security environment. The Ministers confirmed that these efforts will ensure and strengthen effective security and defense cooperation as both countries pursue common strategic objectives. In this context, the Ministers underscored the need to continue examining the roles, missions, and capabilities of Japan's Self Defense Forces and the U.S. Armed Forces required to respond effectively to diverse challenges in a well-coordinated manner. This examination will take into account recent achievements and developments such as Japan's NDPG and new legislation to deal with contingencies, as well as the expanded agreement on mutual logistical support and progress in BMD cooperation. The Ministers also emphasized the importance of enhancing interoperability between U.S. and Japanese forces. The Ministers concurred that this examination should contribute to these consultations on realignment of U.S. force structure in Japan. They decided to intensify these consultations in a comprehensive effort to strengthen the alliance as the bedrock of Japan's security and the anchor of regional stability. In this context, both sides confirmed their commitment to maintaining deterrence and capabilities of U.S. forces in Japan while reducing the burden on local communities, including those in Okinawa. The Ministers directed their staffs to report expeditiously on the results of these consultations. The Ministers also stressed the importance of continued efforts to enhance positive relations between local communities and U.S. forces. They emphasized that improved implementation of the Status of Forces Agreement (SOFA), including due attention to the environment, and steady implementation of the Special Action Committee on Okinawa (SACO) Final Report are important to the stable presence of U.S. forces in Japan. The Ministers, noting that the current Special Measures Agreement (SMA) will expire in March 2006, decided to start consultations on future arrangements to provide appropriate levels of host nation support, bearing in mind the significant role of the SMA in supporting the presence of U.S. forces in Japan.